Ovary - Infiltration cellular, Macrophage in a female B6C3F1/N mouse from a chronic study. 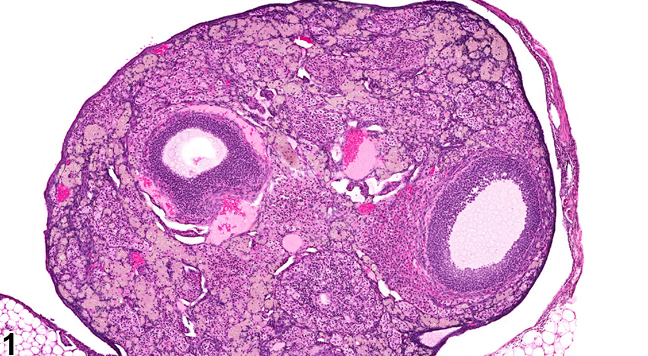 Macrophages have infiltrated the interstitium of the ovary. Ovary - Infiltration cellular, Macrophage in a female B6C3F1/N mouse from a chronic study (higher magnification of Figure 1). 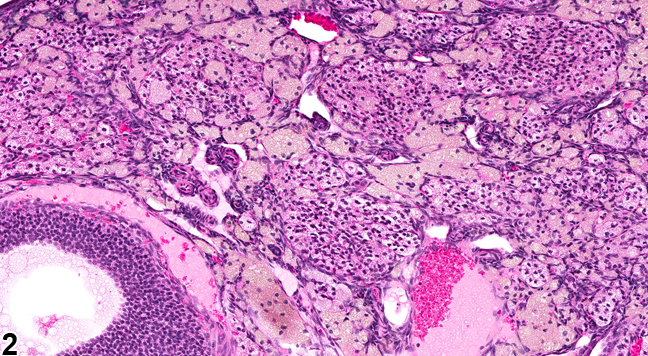 There is a macrophage infiltration of the interstitium of the ovary. Ovary - Infiltration cellular is characterized by the presence of infiltrating cells with no evidence of inflammation (e.g., cell or tissue damage, hemorrhage, congestion, edema) ( Figure 1 and Figure 2 ). Nonneoplastic inflammatory or immune cell infiltration may be a tissue response to any insult or even a change in normal physiologic processes. Many immunologic factors and cell signaling pathways regulate the cellular infiltration process, for which the reader is referred to textbooks of general pathology. If the infiltrating cells are accompanied by other signs of inflammation, inflammation should be diagnosed (see Ovary - Inflammation). Ovary - Infiltration cellular should be diagnosed and graded. The type of infiltrating cell should be indicated in the diagnosis by use of a qualifier (eosinophil, lymphocyte, macrophage, mast cell, megakaryocyte, melanocyte, plasma cell, neutrophil, or mixed cell). The modifier is based on the predominant cell type; if no cell comprises 50% or more, then the term "mixed cell" is used. National Toxicology Program. 2006. NTP TR-533. Toxicology and Carcinogenesis Studies of Benzophenone (CAS No. 119-61-9) in F344/N Rats and B6C3F1 Mice (Feed Studies). NTP, Research Triangle Park, NC.